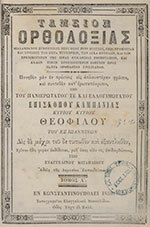 The Foyle Special Collections Library has recently acquired a rare edition of the Ταμείον Ορθοδοξίας (Treasury of Orthodoxy) written by Theophilos of Ioannina (ca 1749-95), bishop of Kampania in what is now the Thessaloniki region of Greece. As a bishop at a time when Greece was part of the Ottoman Empire, in addition to his spiritual authority Theophilos exercised temporal power within his ‘millet’, or confessional community. Taking the form of a dialogue, the Ταμείον Ορθοδοξίας belongs to a tradition of treatises aimed at instructing both clergy and laity in the theology, scriptures and doctrine of the Orthodox Church. One of its themes is the proper use of wealth. 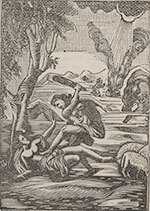 The text was first published in Venice in 1788; a second edition, also printed in Venice, appeared in 1804.
prominent figure in the ‘Karamanli’ press, employing the Greek alphabet to print Turkish language material for Turkish-speaking Greeks. There appear to be no other copies of this edition of the Ταμείον Ορθοδοξίας in libraries in the United Kingdom, or in any other library outside Greece. 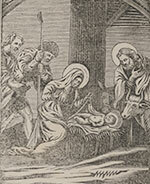 It is of particular interest for its illustrations, 12 woodcuts of (mainly) biblical scenes; subjects include Cain and Abel and the Nativity, which are shown in this feature, along with the title page of the book.